It seems like the malware alarm bells have been going off constantly for Android users over the last two weeks. We’ve had poorly implemented security in Android devices with biometric detection. We’ve had remote support tool applications that grant full access to a target device when provided with spoof certificates, and then we had Stagefright, a critical Android vulnerability that provides access to a device on the back of a malicious media message being received. 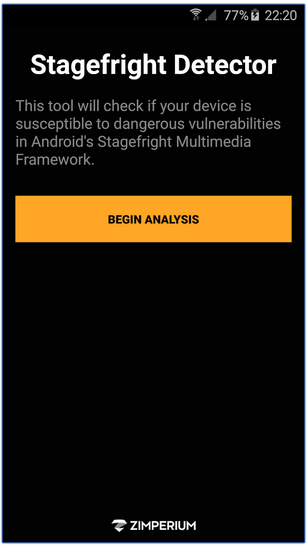 If you have an Android device, and want to find out if Stagefright is a potential issue for you, then this new detection app should be your first port of call. We really can’t offer up any prizes for anyone who guesses what the aptly named Stagefright Detector App serves up in terms of functionality. The official app from Zimperium, the company that actually searched and presented findings on the bug, has built the application as a free-of-charge tool for individuals who have serious concerns about the security of their Android smartphone or tablet. The company may have provided patches to Google and manufacturers as part of the Zimperium Handset Alliance, but as the company rightly points out, “it may be years until they reach all devices”. The Stagefright Detector App is extremely easy to use and exists with two purposes in mind; to immediately inform you if the installed device is susceptible to the Stagefright vulnerability, and whether or not you need to update to a newer version of the installed operating system. In that sense, its simplicity means that it does exactly what it says on the tin and does it with relative ease and speed. Once the app is installed, simply tap on ‘Begin Analysis’ button for the process to begin, as can be seen in the screenshot below. 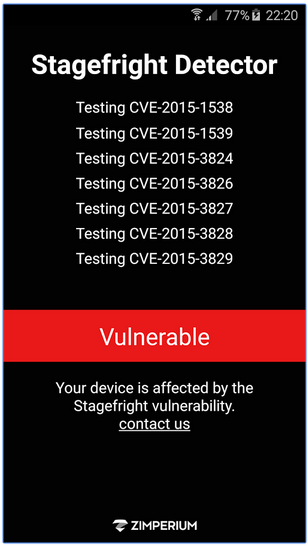 Stagefright is defined by Zimperium Inc. as a critical Android vulnerability. The bug within the Android operating system potentially affords malicious individuals, the ability to gain system or media access on the back of a malware-laden multimedia message. The terrifying part of the whole process is that the media message is actually processed and executed by the OS without any user-interaction, effectively automating the whole device takeover. The infected multimedia message, which would contain a rather innocent looking video for example, then has the ability to delete itself before detection. The potential for damage is rather large which is why it’s important to check out this free app right now. 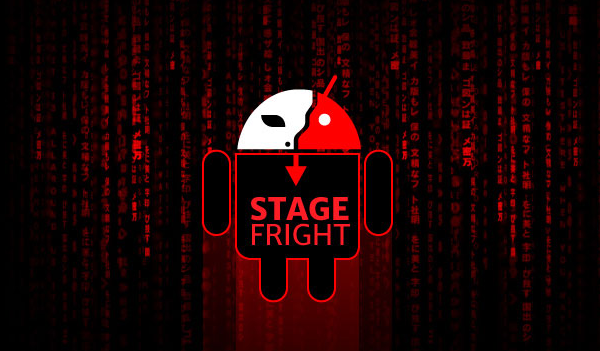 (Download: Stagefright Detector App for Android devices from Google Play). What do we do if its affected!! You can do nothing but wait and wait and wait…for your carrier to may receive a patch from the manufacturer that may will receive a patch from Google for your device (most won’t get and update). With Stagefright you can block automatic openning of MMS files by Android apps on your device. With Certifi-gate nothing can be done on Android. You should do, what you should have done along long time a ago. And you know it. Don’t make me say it. You know what it is. Half hour later, still sitting there. I guess it doesn’t work all the time. any kind of AT&T devices up to date, even the most recent 6 and 6+. Wrong, cyanogenmod team have patched it, and its so typical that unofficial sources would have a fix before officials do. It doesn’t tell you how to protect yourself only that you have a threat. How do I wipe it off? Just turn off auto send MMS for now. Wait lah for Antivirus apps to play catch up.